There are hundreds, if not thousands, of reputable charities. They represent worthy causes up and down the spectrum. However, people trying to scam you in the name of charity aren’t in that group. 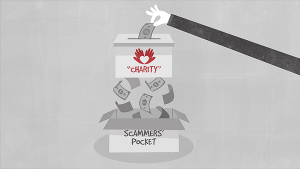 Scammers take the money you give in good faith to use for their own purposes. Be aware that scammers may pose as employees of famous national charities. Be sure that you are really donating to the actual charity and not a false front. Scammers aren’t always located in call centers in foreign countries. The might be in your neighborhood exploiting people to make a quick buck. So-called upstanding businesses often use aggressive telemarketing campaigns to collects funds. On the surface, these charities seem to be honest. If you dig deeper, you’ll find that it’s a front. In 2015, the Federal Trade Commission filed charges against four cancer charities that collected almost $200 million in donations. The money was used for luxury vacations and their family’s salaries. Is It a Phone Scam? Question the caller about the charity’s mission. Ask the representative his or her full name, the charity’s name and address, and how donations will be distributed. Scammers may not be able to answer and hang up. Do not donate at the time of the call. Research the charity online to verify its information and credentials. Charities are required by law to be registered with the state; national organizations can be verified through the Better Business Bureau’s Wise Giving Alliance. If you have found that the charity is real, you can call back or donate via their website. If you donate, be sure to get a receipt. Never give out personal or financial information. Be suspicious if the caller asks you to issue a wire transfer, purchase a pre-loaded debit card or a similar means of payment. Scammers will often play on your emotions. They will tell sad stories about children, veterans or animals; anything that will get a reaction. They may use guilt to get you to donate. Whenever a caller asks for a certain dollar amount, hang up. If you think a call is a scam, report it to the Federal Trade Commission immediately. Also call the local police on their non-emergency line to report it. Why Use A Reverse Phone Number Lookup?